Leaves drop from aspens. Motels are vacant. Does Dubois go quiet? All is not as it may seem …. The aspens are bare. The mountains are cloaked in snow. Winter is coming to Dubois. I’ve chopped down the last hollyhocks and buried them to reseed the garden for next year. 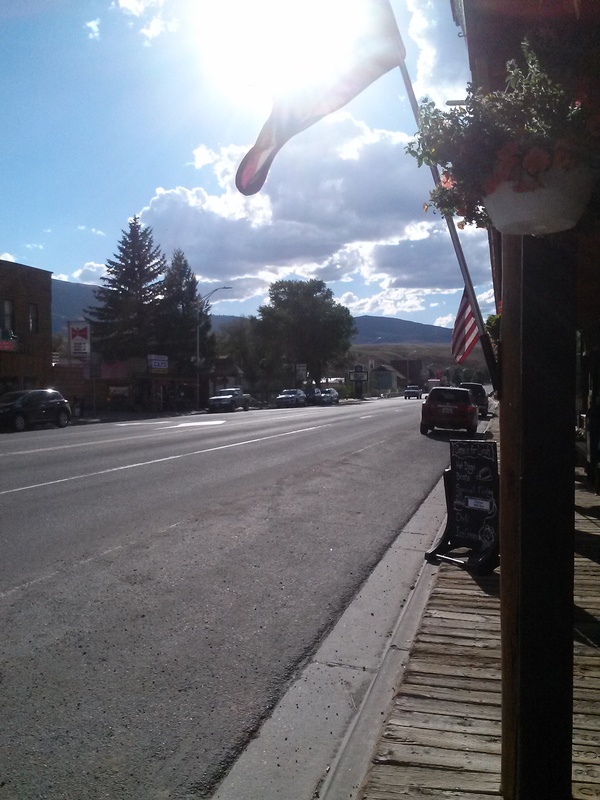 As our “snowbird” neighbors gradually migrate elsewhere, Dubois may seem very quiet and sleepy. But actually, we’re almost as busy as ever. Just look at the events calendar, the posters, the weekly Roundup. Here’s Bonnie Drewenski at the Women’s Expo at Headwaters last Friday, proudly exhibiting some of her hand-crafted clothing accessories — bulky scarves and hats, beautiful scissor-crafted fingerless gloves. The Expo was another opportunity to encounter undiscovered talents in town, and to appreciate what others have been doing when I’ve been so busy this summer. Leianna Jo Raadt offered us great images of our surroundings, ready to send out as greetings. These wind chimes made from antique spoons have shown up at the farmers’ market in the summer, but handcrafted soaps and wildlife paintings by Molly Moore were new delights..
Also on Friday, I snared two of the last 3 tickets to the annual Bighorn Sheep Center Bash, which raises funds for and celebrates our unique center for education and research about these elusive and fascinating residents of our area. This is one table from the silent auction. We raise so much money for our 44 nonprofits by surfacing interesting items from who knows where. The sold-out event was yet another a sign of our immense community spirit in Dubois. These fund-raisers are always well-attended. Think of it: 44 nonprofits in a town of 1,000. So many of our amusements revert to the benefit of a needy few or the entire community. Can you see the excitement in the face of the auctioneer at left? This bird sculpture brought in $600 — a weak showing compared to the $5400 netted in a bidding war over the real horn from one of the sheep, mounted and donated by Tom Lucas. 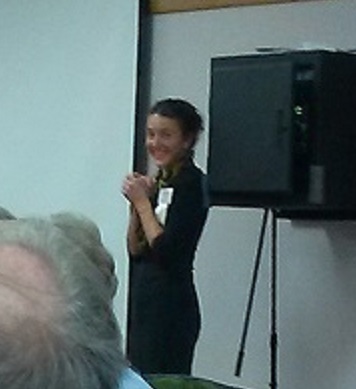 Here’s the center’s new director, Sara Domek, clearly delighted by the success of the event. Dubois has one of the largest year-round populations of these rare sheep, she told me. The Bighorn Sheep Center, which supports research and education into the bighorn sheep, is one of the town’s main attractions for visitors. Sara told me that events like this bring in about a fifth of the center’s funding. The rest comes from foundations.